1- Project title : Performance of different Agroforestry Systems in Semi-Arid Tropics of Andhra Pradesh. Sandal progenies of seventeen clones were established in the year 2002 and evaluated for their performance. The progenies exhibited better growth are AP4, K14, K3 & T26. Plus tree teak and Dalbergia latifolia progenies were collected and raised in Agroforestry trials. The Khammam teak progenies and Jannaram rosewood progenies have exhibited the best growths. Tree crop combinations like Rosewood + Sandal, Teak + Sandal and Eucalyptus + Sandal were raised with agricultural crops like Green gram, Pigeon pea and Jowar in the beginning and afterwards in fourth and fifth years Castor was raised. It was observed that Green gram, Pigeon pea and Jowar have performed on par with control (no trees) in the first three years of the system per unit cropped area under rosewood + Sandal system. However, the yields were found to be reduced in Teak + Sandal and were found to be lowest in Eucalyptus + Sandal system. Therefore, they are in the descending order of their suitability. Castor was not found to be suitable in inter cropping at fourth and fifth years as germination is observed to be poor and are suppressed by weeds. That means growth is very poor increasing the cost of weeding and maintainance and reducing profit margins. Allelopathic studies (pot cultures) revealed that germination was affected by Rosewood, Teak and Eucalyptus in the ascending order. However, the growth was better in Rosewood followed by Teak and Eucalyptus. Sandal was intermediate in response. Therefore, germination is affected but growths in Rosewood and Teak are not affected by leachates and litter upon decomposition. That means the reduction in growth observed in individual plants may be due to competition and may not entirely be due to allelochemicals. 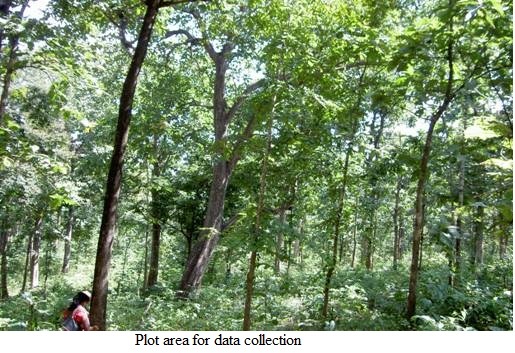 2- Project title : Assessment of Impact of Forest Fire on the regeneration of Forests in Andhra Pradesh. Analysis of three indicators like Important Value Index (IVI) and Shannon Biodiversity Index and Evenness Index together to conclude that though fire had no significant effect on changing the species richness i.e., total number of species in the given plant community, it has significantly altered the abundance of the species. In fire affected areas community was pushed to more unevenness, thereby reducing the species diversity of the community. The reason may be that in fire affected areas species that are resistant to fire were more successful in survival and hence more abundant, pushing the community towards unevenness thereby reducing the species diversity. That is why it appears that though there is no significant change in species richness in fire protected and unprotected areas, species diversity was significantly lower in fire-affected areas. It is pertinent observation that on fire effected areas pioneer species of Cyperus, Panicum, Phyllanthus are dominating. Fire indicator species like Sida, Cassia species are appeared. When forest is subjected to openness most Graminaceae species dominates the ground floor. In protected forests where the fencing or the protection from grazing is provided there is significant regeneration of the tree species, especially Tectona grandis, Lagerstroemia, Azadirachta, Anogeissus spp., Someida and Terminalia Species are observed. Regeneration of Dendrocalamus was promising in protected forests. 3- Project title : Estimation of Variability in Pterocarpus marsupium and germplasm collection. A total of sixty populations were studied based on provenance delimitation criteria and based on stem form, height and GBH selected some of the populations that are known to be better than the others for these parameters. A number of plus trees were marked in various parts of the AP and Karnataka. A total of 400 seedlings were planted in FRC Campus from selected mother trees from different places of A.P. 4- Project title : Studies on phenotypic variation in Pterocarpus santalinus and collection of germplasm. A total of sixty populations were studied based on provenance delimitation criteria and based on stem form, height and GBH selected some of the populations that are known to be better than the others for these parameters. A number of plus trees were marked in various parts of the AP. Propagated 250 plants from different collections and maintained them well from 60 candidate trees by vegetative means. The vegetative propagation technique could be standardized in this case. [It is a hard to root species]. The populations surveyed is Kurnool, Cuddapah, Anantapur and Chittoor districts of AP and identified certain trees for collection of germplasm. 5- Project title : Dynamics of Insect Populations in Agroforestry Systems. Seasonality of cotton insect pests was not influenced by the introduction of perennial tree component in cotton ecosystem. 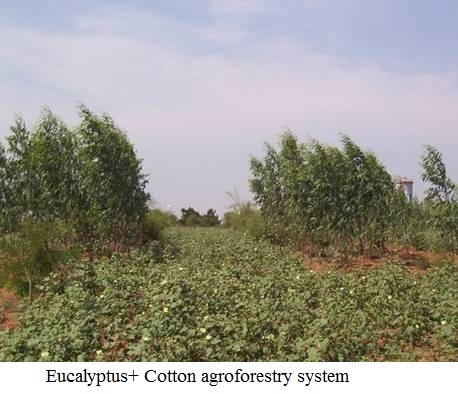 Incidence of insect pests of cotton was influenced by the introduction of perennial tree component in cotton ecosystem. Incidence of cotton thrips and Jassid was found to be more in cotton sole crop as compared to cotton in combination with tree components. Population of natural enemies was more in Aonla+Cotton, Custard apple+Cotton systems as compared to cotton sole crop. 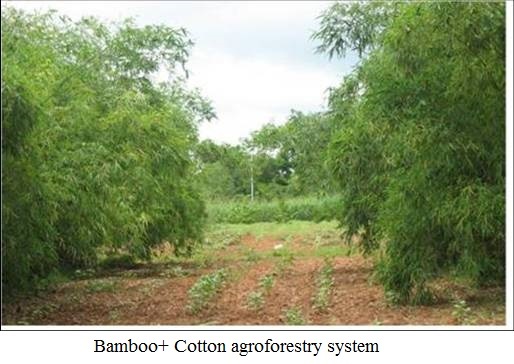 Custard apple+Cotton and Aonla+Cotton systems were found to be suitable agroforestry combinations. Yield of cotton in Custard apple+Cotton is comparable with yield of cotton in sole crop without any use of insecticides. Over all economics of Custard apple+Cotton and Aonla+Cotton was found to be favourable. Two species of Lagerstroemia prevalent in AP and Karnataka are surveyed and several populations were identified from more than sixty populations. The processes of germplasm collection and multiplication by vegetative means have not been successful. The seed from different places is collected and stored from the better known populations. The progenies are being raised for posterity. 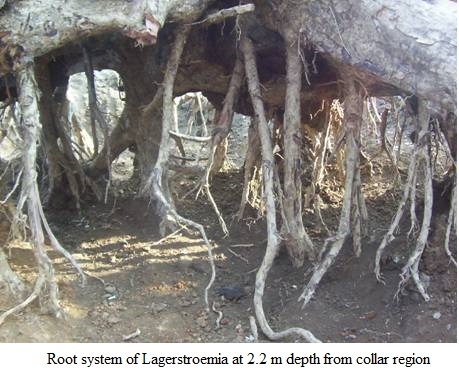 The best populations of Lagerstroemia were identified in Medak, RR Dist. 7- Project title : Natural variation studies in Rosewood (Dalbergia latifolia Roxb.) for tree improvement. A total of sixty populations were studied based on provenance delimitation criteria and based on stem form, height and GBH selected some of the populations that are known to be better than the others for these parameters. A number of plus trees were marked in various parts of the AP and Karnataka. Their progenies numbering 399 were raised from 48 plus tree population both from Karnataka (100) and from A.P. (299). Apart from this a total of 30 root suckers collected from the best known source survive in the campus which was brought from field. 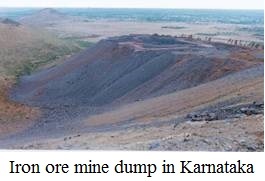 8- Project title : Reclamation of Iron Ore mine spoils in Karnatakaka through afforestration. 1- Project title : Estimation of Carbon Pool in Western Ghats Development of Biomass Expansion Factors sponsored by National Remote Sensing Agency, Hyderabad. The complete set of data on one hectare plot is collected and compiled and analysed for both the above ground biomass of 319 trees and below ground biomass of live trees at 0.25 S.I. and 865 trees of 30 quadrats laid at random in a systematic random sampling method. The below ground biomass studies comprise a total of 300 trees by destructive method and 115 live trees by non-destructive method representing as far as possible all diameter classes apart from 76 live trees of lower diameter classes. The litter fall and forest floor quantification studies are complete in all respects for the study period and the results are summarized accordingly. Phytosociological analysis is completed for moist deciduous forests. The facilities for Soil Organic Carbon and specific gravity studies were created in house. The plant Carbon was estimated through CHN auto analyser by outsourcing. 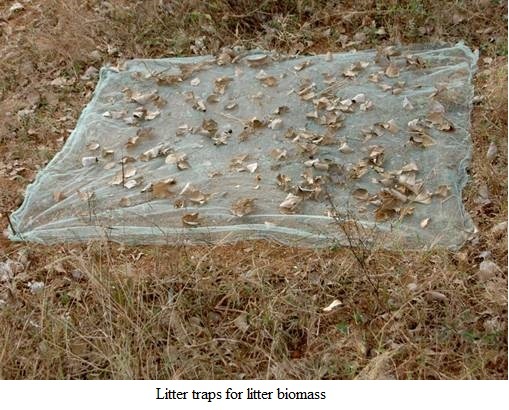 The shrub and under storey biomass from 120 plots of one square meter were collected and their dry weights estimated. Apart from developing the species specific equations for Xylia xylocarpa, Dalbergia latifolia, Tectona grandis, Lagerstroemia lanceolata, Terminalia tomentosa, Terminalia paniculata, and Dillennia pentagyna. 2- Project title : Impact of clonal Eucalyptus plantations on soil physical, chemical properties in farmers land in Andhra Pradesh. At all the locations of clonal, seedlings Eucalyptus Plantations, nitrogen percentage is lower in range and very negligible in seedling plantations, There is a steady decrease of nitrogen from younger to older plantation and it is lesser than it is recorded at agriculture land, showing negative impact of nitrogen percentage by growing Eucalyptus plantation in agriculture land. Except in certain places Phosphorous, Potassium values are higher than in adjoining agriculture lands, giving positive impact of growing eucalyptus in farmer's land. It is noted that decrease of phosphorus from younger to older plantations. Hence the impact of eucalyptus plantation on farmer's land is not significant except for nitrogen. 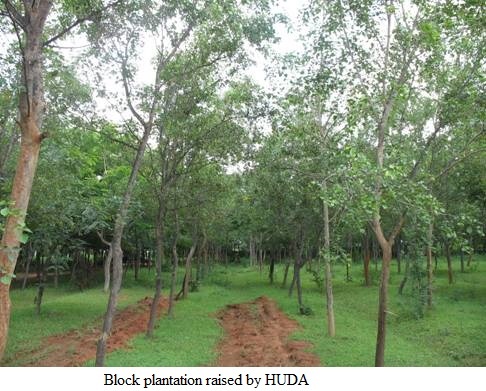 Biomass estimated from 6591 ha of Urban forests raised by HUDA. The total biomass was found to be 431,226 tons. The total Carbon stock 194,052 tons, the CO2 reduced from atmosphere was 711 523 tons and total oxygen released in the process stood at 517 472 tons. 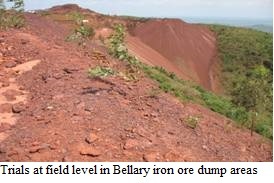 Besides, there was an additional Carbon stock of 105 983 tons of Carbon in soil. That totals another 388 604 tons of CO2. Therefore, the total Carbon dioxide sequestered stood at 1099 128 tons from 1994 onwards in the City of Hyderabad. The biomass levels were compared with pollution levels in the City from the data collected and compiled from secondary sources from six different places in the City and measuring the biomass in that area. Based on regressions, to bring down pollution to 1990 level an amount of one million ha additional plantation was estimated to be required. 4- Project title : Bioecology and Integrated Management of Insect Pests of Aonla, Emblica officinalis Gaertn. Insect pest incidence and their seasonality in aonla was recorded at Rajahmundry and Hyderabad locations. Aonla aphid, Cerciaphis emblica, stem gall insect, Betuosa stylophora, and Bark eating caterpillar, Inderbela sp. followed by Nipaecoccus viridis were identified as key pests of aonla. Five synthetic and one botanical insecticide viz., Dimethoate, Imidacloprid, Spinosad, Profenophos, Neem Seed Kernel Extract, and Acetamipride were evaluated under field conditions at Hyderabad in the month of March, 2008 against Aonla aphid, Cerciaphis Emblica on the cultivar Chakiya. Dimethoate 30 EC, Confidor 17.8 SL, and Profenofos 50 EC were found highly effective at 0.06, 0.036, and 0.1 per cent concentration respectively. The project is funded by National Medicinal Plants Board, New Delhi . 3- Project title : Screening of certain forest flora based on ethnobotanical properties for their bioefficacy against inset pests. 5- Project title : Studies on Macro propagation of Bamboo species. 1- Project title : Development of Multitier cropping model for medicinal plants in Andhra Pradesh.